For a simple, savory appetizer or side dish, look no further than these brussels sprouts with prosciutto. The crispy prosciutto’s subtle saltiness perfectly complements the spiciness of the roasted brussels sprouts, creating a dish with rich flavor that gives taste buds a kick. Great to serve alongside main dishes or as a fiery appetizer, these peppery brussels sprouts with Prosciutto di Parma are a quick way to add heat to any gathering. For your guests, serve them on their own or together with a variety of Italian cheeses, nuts, and olives for a flavorful take on the traditional party platter. Pair with a zesty Sauvignon-Blanc to balance both the Prosciutto di Parma and the brussels sprouts. Recipe originally featured on The Taste SF. Toss brussels sprouts in olive oil, salt and hot pepper. Arrange in a single layer on a sheet pan and roast for 20 minutes. When done, the brussels sprouts should be somewhat crispy, not burned. Cut the Prosciutto di Parma into thin strips, about 1/4-inch wide. While the sprouts are roasting, sauté the Prosciutto di Parma strips in a skillet until begin to get crispy. 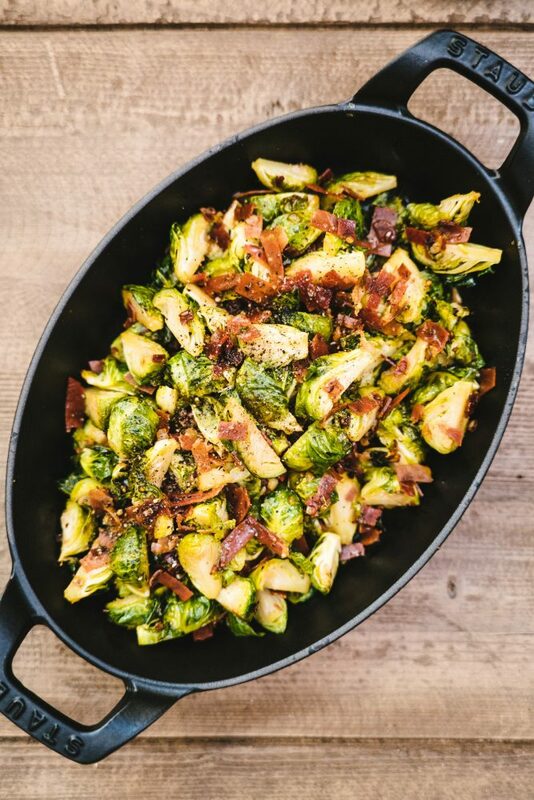 Remove the brussels sprouts from the oven and place in a serving dish; add the crispy Prosciutto di Parma and toss. Finish with salt and pepper.